Below are some of our basic prices. Due to the specialized nature of cake decorating, please call for more information and a quote based on your specific needs. Thank you! * Please allow two weeks notice for party cake orders. Cakes for special occasions are subject to a minimum order of $100. A $400 minimum order applies to all weddings from May through October. We currently accept cash or check. "The cake was AWESOME! Everyone enjoyed it so much some guests even had seconds! We had so many compliments from our friends and family and the North Peak staff as well. 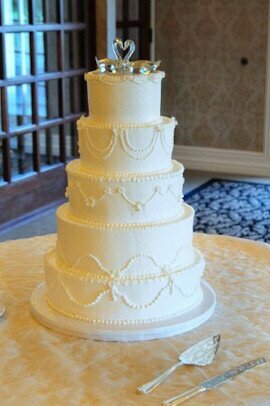 Mike was very impressed that he has now had a wedding cake that tasted great as well as looked great. Once we saw the cake we knew we didn't need flowers to put on it,they would have hidden the beautiful masterpiece. Words cannot express how well our idea came to life. "Thank you again for making our special day that much better!" "Oh my goodness, Sherri. Our cake was beyond perfect. It was exactly what I had dreamed of. Everyone at the wedding was saying how amazing the cake was! I wanted to send you a picture our photographer took I think you will love it. Thank you so much! You were so wonderful to work with!!"